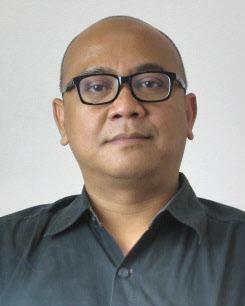 Hagung Kuntjara SW, was born in the city of Kediri, East Java, 48 years ago. He completed his undergraduate degree, majoring in Visual Communication Design, at Institut Seni Indonesia (ISI), Yogyakarta in 1992. He then pursued a master’s degree, majoring in Visual Communication Design, in Program Pasca Institut Seni Indonesia (ISI), Yogyakarta in 2013. Aside from lecturing in the department of Creative Advertising, he also leads as Head of Creative Advertising Program. His works allow him to be a seminars and creative workshops speaker for the development of brands and Illustration, Book Design, etc. In 2013, he was won as 10 best design in Reka Rupa Design Indonesia, Directorate General of Creative Economy through the Interactive Digital Book ‘Setu Babakan’.